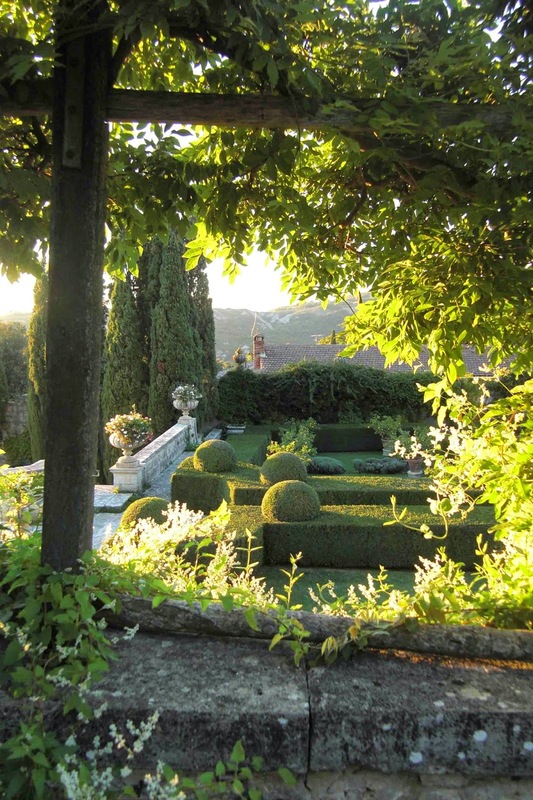 Surrounded by the green of the wisteria arbor, I watched the late afternoon sun gild the perfect spheres of boxwood in the Lower Garden at La Foce, southeast of Siena. As the garden became more golden, the surrounding hills and mountains turned blue and misty. When Cecil Pinset designed this garden in the 1920s, he created a series of spaces that range from colorful English flower beds to symmetrical European-style clipped hedges to travertine walls and overlooks shaded by tall Italian cedars. With hydrangeas and full-blown roses were just behind me, the rugged landscape of the Val d’Orcia was the dramatic backdrop.